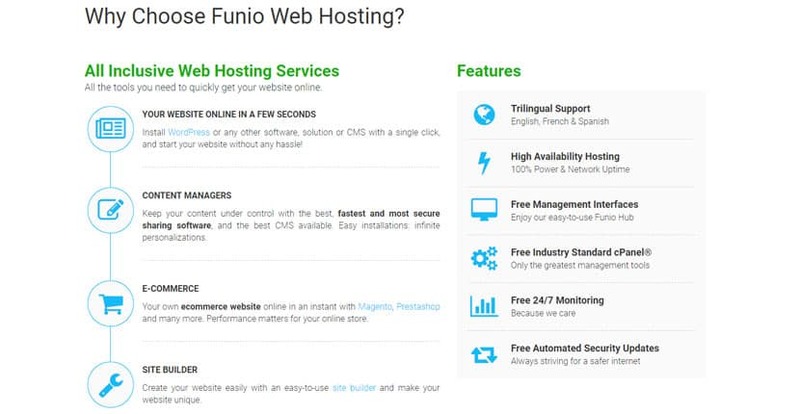 Funio Review 2019: Is Funio a Good Hosting? Since 1999, Funio has built a reputation as a quality web hosting vendor in Canada, the United States, and beyond. The hosting provider’s 100% network uptime and power availability guarantee gives their 21,000+ strong customer base great peace of mind. Since 1999, Funio has been delivering sturdy, beginner-friendly, and fast web hosting solutions all around the world. Over the years, the vendor has built a reputation as a quality hosting provider for shared hosting as well as VPS services. With over 21,000 customers from over 141 countries across the globe, Funio has truly found a way to be a notable player in this space. Funio’s website is available in English, Spanish, and French. Web Hosting – Funio simplifies web hosting to make sure that beginners and experts can make the most of their platform. Funio customers have four shared hosting packages to choose from: Economic, Unlimited, Startup, and SMB. The Economic plan is the most basic and includes one website, ten databases, 20GB storage, 100 emails, and 250GB bandwidth. The Unlimited plan includes a free domain registration for one year. WordPress Hosting – All Funio WordPress hosting plans include free backups, WordPress pre-installed the moment you load your account, automatic WordPress core updates, and 24/7 support. The plans are named Starter, Pro, Expert, and VPS. The Starter plan is the most basic. It includes a single hosted website and 20GB storage. If you want a free domain registration, go for their Pro plan instead. E-commerce Hosting – Funio’s e-commerce hosting is designed to offer secure and fast online store solutions using Magento, OpenCart, Prestashop, and osCommerce. The hosting provider customizes server configurations for their clients to provide hassle-free hosting solutions. Managed VPS Hosting – Funio’s managed VPS hosting is a combination of power, reliability, and flexibility. These plans allow for the easy scaling of resources directly from your user admin panel, and the fully managed environment allows you to focus on your website without worrying about the backend. In addition to the above plans and features, Funio’s zero downtime architecture assures their customers of 100% power and network uptime. This high availability is especially important for e-commerce websites whose bottom line would take a serious hit as a result of incessant downtimes. You can procure free SSL certificates with any hosting plan you purchase from Funio. All of their hosting solutions are designed with beginners in mind. The platform is simple to use, even for those creating websites for the very first time. Funio has gone out of their way to create affordable, easy-to-use web hosting solutions for both beginners and experts. The company offers free automatic updates for all their hosting packages. They also provide free backups and charge very low rates for the first month of hosting — thereafter, their prices increase to the market average. These would seem to be adequate measures to compensate for their lack of both a free version of their hosting plans and a trial period. Funio also offers a 30-day, no questions asked money back guarantee. This guarantee assures the customer of a full refund if for whatever reason, they are unsatisfied with the web hosting services that Funio provides. Funio’s technical support is noteworthy. In addition to being available 24/7 all year round, Funio’s support is trilingual: it is available in English, Spanish, and French. What’s more, you can contact the support team via several phone numbers, including a toll-free number. If you’re feeling old-school, you can even fax them your concerns and have them addressed swiftly. Additionally, Funio has made available other support platforms including email and a ticketing system. However, in my experience, email is the fastest and the most effective way to contact Funio’s support team. The steady growth that Funio continues to enjoy is a testament to the quality of service this web hosting vendor provides. With a combination of affordability, ease of use, and noteworthy support, it isn’t surprising that many across Canada, the U.S., and the rest of the world would want to engage Funio’s hosting services. Wondering how Funio stacks up against other Web Hosting companies? Enter any other Web Hosting company and we will give you a side-by-side comparison.